The skeletal recreation of Pier 52, an abandoned industrial shed that once jutted into the waters next to the High Line, will rise courtesy of the Whitney Museum, artist David Hammon, and a recent legislative victory in the New York State Senate. The pier was once a hub of for artistic intervention and under-the-radar sexual liberation, and Hammon has titled his “new” Pier 52 sculpture Day’s End after Gordon Matta Clark’s 1975 transformation of the building. The public piece was first announced in October of last year, and the Whitney has taken pains to avoid the mistakes of the adjacent Pier 55 by engaging with the local community boards at every step of the planning process. Complicating the sculpture’s installation has been the Hudson River Park Act, which established the Hudson River Park Trust’s stewardship of the waterfront and environmental protections for the river. Now, after the passage of legislation by New York State Senator Brad Hoylman yesterday (S8044A), the Hudson River Park Act has been amended to allow Day’s End to rise after all. 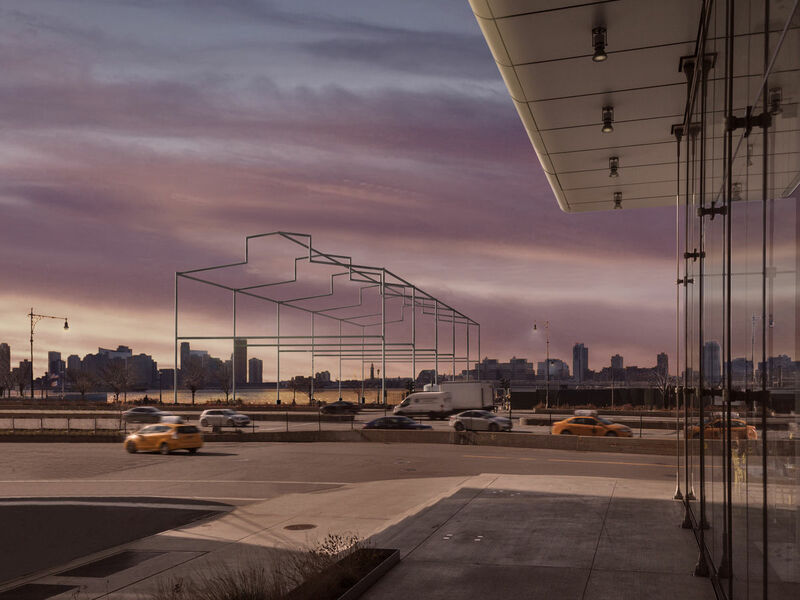 While the Whitney will construct the stainless-steel sculpture offsite over a period of eight to 10 months and maintain the piece, the museum will be required to donate the sculpture to the Hudson River Park Trust under S8044A. While there are still regulatory hurdles to get over, Day’s End recently cleared a vote in the State Assembly and is likely to breeze to fabrication. Construction on the $30 million renovation of Tribeca’s Pier 26 is slated to start up this summer, and the Hudson River Park Trust and landscape architects OLIN have released a new batch of renderings of the project’s final design. The Hudson River Park Trust went before Community Board 1’s Waterfront, Parks & Resiliency Committee last Tuesday and revealed their finalized design for transforming the 790-foot-long concrete pier. While OLIN had released glimpses of the pier’s programming before (including a playground with two enormous sturgeon-shaped jungle gyms for kids to climb), the latest design incorporates many of the features that the local community had hoped for. A gentle grass lawn and more wildly-planted “forest” area with indigenous trees will guide visitors from the western edge of Hudson River Park, towards the two child-sized soccer fields in the middle of the pier. The fields will be covered in a blue net to stop stray balls from flying into the Hudson River, and surfaced with a plastic grid capable of draining. Further west will be a lounge deck with steps adjacent to scrubby, dune-like landscaping. OLIN has designed a tiered tidal pool planted with native flora at the pier’s westernmost tip, as well as a wooden esplanade that zigzags across the length of the pier. The walkway will rise 15 feet in the air at the tip of Pier 26, giving guests a full view of both New Jersey across the river, as well as the tide pool below. OLIN will be using Kebony for the path, an engineered sustainable softwood. Planned for the space between Pier 26 and 25 is the Estuarium, a two-story, Rafael Viñoly Architects-designed education center. Only $10 million of the center’s required $50 million has been raised so far. While no start date has been set for the Estuarium’s construction, it could imperil the pier’s 2020 opening date; the site chosen for the sturgeon playground will be used a staging area during the education center’s construction (sorry, giant metal fish fans). Construction on the underside of the pier will run from this summer until next year, followed by the work on the structure's topside. OLIN and the Hudson River Park Trust have revealed updated designs for Pier 26 in Tribeca. The waterside space, part of Hudson River Park, will now feature a playground with two large, very scalable fish. The Philadelphia firm initially presented a comprehensive plan for the pier to Manhattan Community Board 1 last December. The latest design meeting in September, however, focused on the nautical playground, which sits near the pier on the mainland. 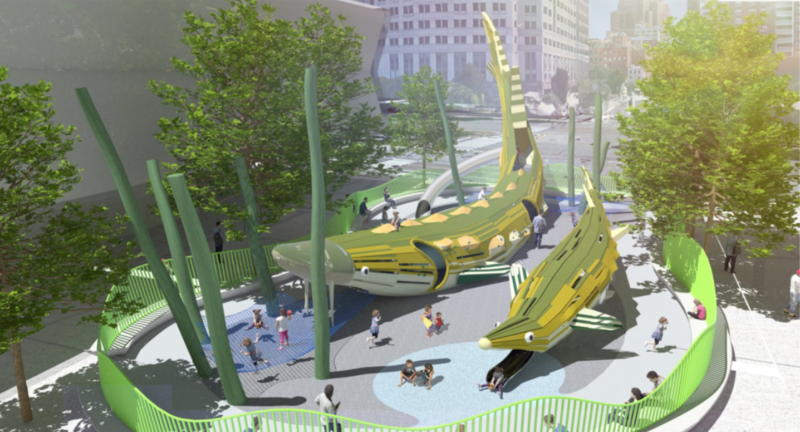 While the December plans featured a“nest pod” playscape, the new playground's centerpiece is an Atlantic sturgeon and a shortnose sturgeon, supersize green metal versions of endangered Hudson River species that children can climb on, dart inside of, and slide through. The design is in keeping with the Trust's mission to steward the Hudson River estuary and provide low-cost or free educational and cultural programming to residents. In addition to slides and climbing pegs, the larger Atlantic sturgeon would have three entrances and a "play bubble" at one end, while the shortnose would have an ADA-accessible slide that unfurls from its mouth. Construction on the playground is slated to begin early next year. (All gallery images were obtained via Tribeca Citizen.) 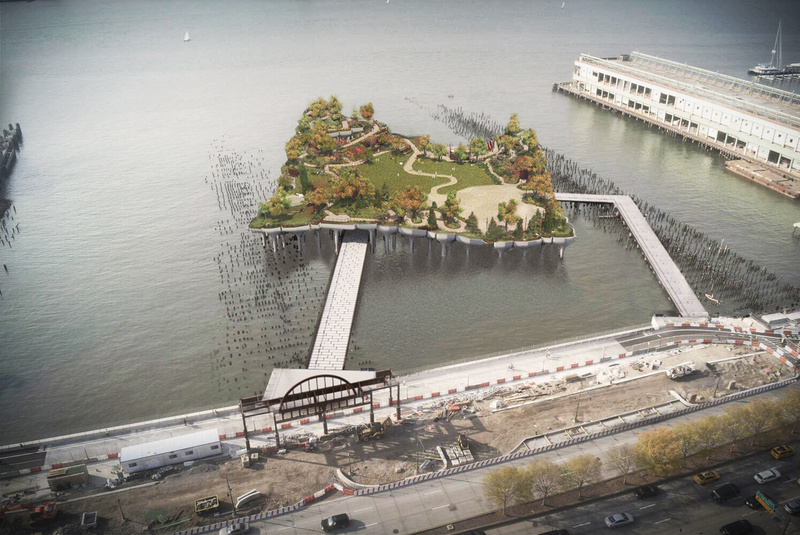 Right now, plans feature sports fields, an overwater net for lounging, and other recreation spaces atop the 80,000-square-foot pier, which sits on Manhattan's far west side between Hubert and North Moore streets. The sturgeon playground is sited just to the south of City Vineyard and the Downtown Boathouse, Pier 26's commercial occupants. 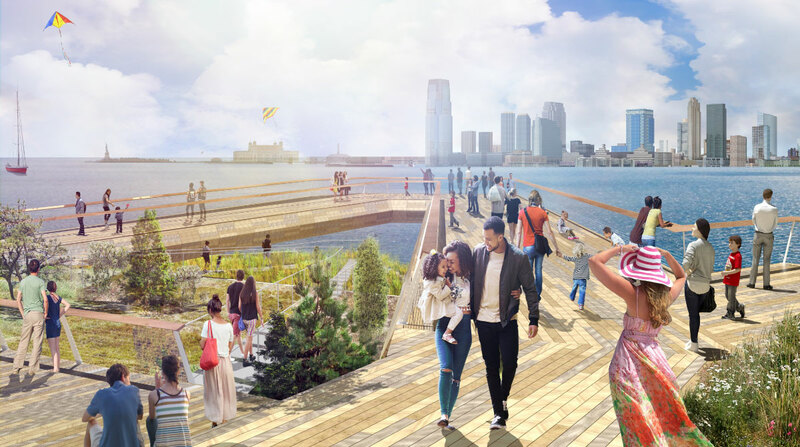 Development of the pier has been a long time coming: In October 2015, the Trust brought on Raphael Viñoly to design an estuarium, and eventually, the group would like to build a river study center to complement the park's recreational programming. The Tribeca Trib reports that the Trust is still seeking money for the Viñoly project, while the river center is currently neither fully designed or funded. Pier 55 is totally, completely dead in the water. Financier Barry Diller, the pier's main backer, announced yesterday he was withdrawing support for the $250 million project. Hudson River Park Trust, the organization that runs Hudson River Park and would steward the pier, was in the midst of settlement talks with Pier 55 opponents following recent court battles. The City Club of New York, a small civic organization, took the Trust to court on multiple occasions to fight the proposed pier, which would rise 14 stories at its highest point from custom "mushroom cloud" pots atop white piles. 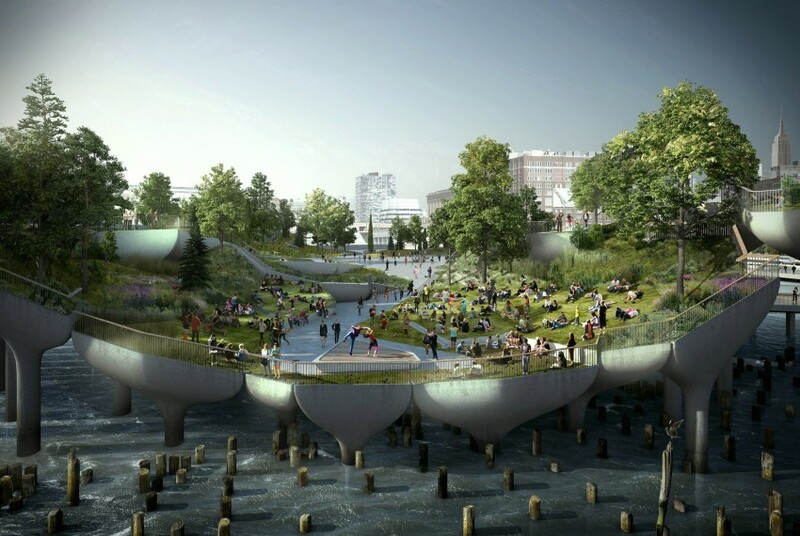 Designed by Thomas Heatherwick with landscape architects Mathews Nielsen, Pier 55's lush greenscape was programmed for performing arts. For years it was rumored that developer Douglas Durst was secretly bankrolling the City Club's lawsuits, and in May Durst confirmed he was funding the court challenges in an interview with The Villager. “Because of the huge escalating costs and the fact it would have been a continuing controversy over the next three years I decided it was no longer viable for us to proceed,” an upset Diller told The New York Times. In an email to Pier 55 supporters, Diller lamented that a “tiny group of people had used the legal system to essentially drive us crazy and drive us out." Diller's decision ends one of the most captivating public spectacles in recent memory. The troll-fest had the two billionaires running to almost every New York City paper to leak information, drop disses, and escalate their mutual antipathy with a vigor rivaled only by Cuomo and de Blasio's pettiness. (Durst: “I have nothing against Diller—except he said he wishes I had been killed by my brother.") Even the City Club was surprised by the news. Its lawyer, Richard Emery, called Diller's move "a great decision,” adding that it respects the estuary, a point of contention in the group's recent legal battles. Besides the ego feuding, it is also Heatherwick's second high-profile project to meet the rubbish bin in recent weeks. The London designer's Garden Bridge, a massive verdant expanse over the Thames River in London, was killed by the city in April. Update 7/21/17: This story has been updated with additional information on the City Club's recent activity, and the Army Corps of Engineering permitting process has been clarified. Just when waters seemed calm, a new player has waded into the public spectacle that is the fight over Pier 55. To move the pricey project forward, Mayor Bill de Blasio has asked developer Douglas Durst to stop funding lawsuits against it. The $250 million project is spearheaded by the Hudson River Park Trust, the public benefit corporation that manages Hudson River Park. The group, backed by substantial contributions from financier Barry Diller, asked London's Thomas Heatherwick to design a whimsical public space programmed for entertainment back in 2014. But almost since its inception, Pier 55, which is sited near Manhattan's West 13th Street, has been dogged by lawsuits from the City Club of New York, a once-dead civic organization that resurfaced in 2013 to challenge initiatives like the Midtown East rezoning. But the Mayor's call to Durst last week may be paving the way for talks between the City Club and the Trust. Emery told the Times his client won't go to the table unless the park agrees to greater transparency in the future, giving stakeholders with divergent viewpoints space to discuss projects like Pier 55. (The Trust maintains its public review process for the project was above-board.) Right now, it's not clear what a settlement would include. Durst wasn't always a foe of the group: He served on the board of Friends of Hudson River Park, a fundraising team that supports the Trust, but quit in December 2012. This May he confirmed rumors that he has been funding the City Club's lawsuits all along. None of those cases were successful until March of this year, when U.S. District Court Judge Lorna G. Schofield ruled that the pier would negatively impact the rivers estuarine sanctuary, and thus countered the Trust's mission protecting the Hudson. After the Trust addressed the issues Judge Schofield cited in her decision, the Army Corps of Engineers issued a new pier permit in May. The fight over Pier 55 continues: the group in charge of Hudson River Park has filed a new application to build out the pier and has appealed a recent court decision that effectively stopped construction on planned a concert venue and park over the Hudson River. In March, Judge Lorna G. Schofield of United States District Court sounded an apparent death knell on the project with a decision that said the Hudson River Park Trust and the Army Corps of Engineers had failed to adequately assess how the pier's construction would impact the river's estuarine sanctuary. Yesterday the Hudson River Park Trust and the Army Corps of Engineers, which oversees construction on the river, filed an appeal of the judge's decision. The Trust also filed a modified permit application in late April that addresses some concerns raised in Judge Schofield's decision. The new application nixes the barge that would be stationed alongside the pier and proposes a non-concrete fill for the mushroom-cloud "pots," the piles supporting the lawn, stage, and other planned programs on the $250 million pier. The project is designed by London's Heatherwick Studio, the same firm behind the recently axed Garden Bridge over the Thames. “Our new application eliminates that concern because there is no longer any fill proposed,” Trust spokesperson James Yolles told the New York Times. A civic group, the City Club of New York, has led a public crusade against the project, filing multiple lawsuits to stop its construction. The group argues that the Trust developed and approved Pier 55 in a secretive fashion, largely outside of the public eye. 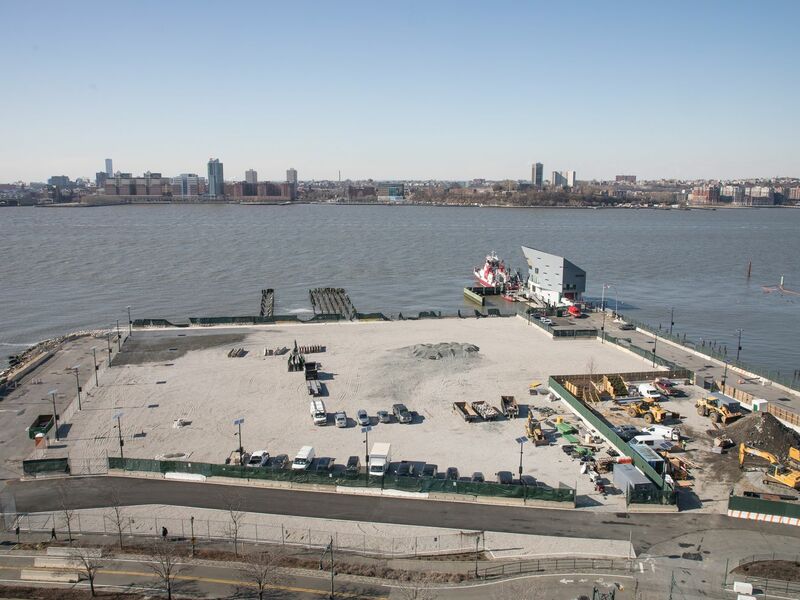 The Trust maintains that the pier, with its ample recreation opportunities and performance venue, would be an asset to the area, and a positive extension of the four-mile-long Hudson River Park it stewards. Financier Barry Diller and his wife, fashion designer Diane von Furstenberg, are fronting most of the money for the ever-more-costly pier. On Monday, Diller told the Times that, though he's still with the project, he's “ambivalent” about it because approvals are being stymied by opponents like the City Club. That fight is playing out in local media, including the pages of this paper. Diller has said that the City Club's battle was financed by real estate mogul Douglas Durst—an accusation Durst himself confirmed in an interview with The Villager last week. It looks like the Heatherwick pier on the Hudson is a no-go. A federal court vacated the permit for building Pier 55, which was designed by Thomas Heatherwick and largely funded by fashion designer Diane von Furstenberg and her husband, financier Barry Diller. Envisioned as a performance and events space that extends from Hudson River Park near 13th Street, the $200 million pier has sparked controversy from its inception. Opponents, led by advocacy group the City Club of New York, found little public benefit in the project. The group asserted that the pier's undulating topography, supported by distinctive mushroom-cloud piles, would block views across the river from Hudson River Park, stir up pollutants in the silt, and block sunlight from hitting the water, making it a threat to marine life in the Hudson River estuary. From certain angles, the pier could be much flatter than initial renderings suggest. In turn, the Hudson River Park Trust, the nonprofit that manages the park, declared that the 2.75-acre structure would provide much-needed recreation areas and cultural programming for thousands of New Yorkers. The City Club brought multiple lawsuits against the Trust. In the latest, Judge Lorna G. Schofield of United States District Court said that Pier 55, despite its name and location, was mostly a park and a concert venue, and therefore wasn't dependent on the Hudson River for its existence. Unlike kayakers who depend on a boat launch, or swimmers on the beach, concertgoers and joggers could just as easily listen to music or work up a sweat somewhere else. "We're very happy," said Michael Gruen, president of the City Club, told The Architect's Newspaper. "It looks like this ruling may be very beneficial for the public in terms of finally being done with a project that would obscure the view of the water and could very well go somewhere else." Schofield's ruling, moreover, determined the pier would interfere with the Trust's fundamental obligation to maintain the Hudson as a fish and wildlife refuge. The Trust shared the following statement when reached for comment: "We have won four challenges in four courts on this project. Not one of those decisions determined the proposed project would harm the environment—and neither does this one. But even if largely procedural, we are deeply disappointed by this ruling, and are reviewing it carefully to determine our next steps." To continue the project, the Trust could re-apply for a permit with the Army Corp of Engineers, but the ruling (below) would make it almost impossible to build out Heatherwick's vision. This post was updated with more information on the March 23 ruling. The City Club of New York is turning up the heat on the Hudson River Park Trust over the "secret, last-minute architectural design changes to Barry Diller's proposed Pier 55 project." In what may prove to be the most consequential "bait and switch" since Bruce Ratner tried to slide a third rate design for his Atlantic Yards arena past the trained eye of City Planning Commissioner Amana Burden, Pier 55 last week morphed into a less than thrilling design. Whatever the public merits of the Thomas Heatherwick design, at least its water-facing base was a fantastical undulating platform that continued up the sides of the park. That pod frame has now become a “conventional flat pier,” or as the City Club claims, "a pale parody of the original." The City Club has filed a Freedom of Information Law (FOIL) request with the Hudson River Park Trust asking for "any and all" records pertaining to "the new design of Pier 55, as presented in a joint application for a modification" to the U.S. Army Corps of Engineers and the State Department of Environmental Conservation. A City Club press release announcing the request claims that the Trust's "approach is consistent with the back-room dealing and lack of transparency that have characterized this project from day one." UPDATE: At 3:45 pm today, the Hudson River Park Trust issued a response to The Architect's Newspaper. That response is located immediately below. A full press release from the City Club of New York (included in this article's original form) is located farther down. The Trust has made technical alterations to make the project easier to build, but the topography, landscaping, program and size have not changed. It's unfortunate but not surprising that the plaintiffs—who have now lost four times in four courts including the highest in the state—are making another desperate attempt to derail a project that has strong support among neighborhoods along the park, Community Board 2, park advocates and prominent civic groups. The plaintiffs' depiction of the submission of a FOIL request as a "major development" is ludicrous and illustrative of their desperation. Construction continues and we're looking forward to opening this addition to ‪Hudson River Park in 2019. This article has been updated with a new statement from the HRPT on the pier's design. The newest waterfront park on the Hudson may not appear quite like the stunning first renderings suggest. The Hudson River Park Trust (HRPT), a public benefit corporation in charge of Hudson River Park, wants to change its plans for the design of Pier 55. Initially conceived as an undulating 2.7-acre park supported by more than 500 mushroom cloud–like "pots" (precast concrete piers), the park was downsized slightly (to 2.4 acres), and many of the signature pots will be replaced by a flat structural base sandwiched between the piles and the landscaping. Conceived by London-based Heatherwick Studio and executed in collaboration with landscape architect Mathews Nielsen, the pier's sculpted topography, rising to six stories in some places, would host concerts, events, and public art in a sylvan setting that draws inspiration from the colors Acadia National Park in Maine. Over the objections of public space advocates, most of Pier 55's design and construction costs are being paid for privately by the fashion designer Diane von Furstenberg and her husband, media executive Barry Diller. Overall, estimates place the project cost at more than $200 million, with the city contributing $37 million in funding. The Architect's Newspaper obtained a copy of a permit modification request the HRPT submitted to the Army Corps of Engineers that outlines changes to Pier 55's design (PDF). The changes raise questions about its final appearance, and about a design process that's shaped a major public space largely outside of the public eye. The modifications dramatically reduce the number of pots, a signature design element. In a letter to the Army Corps, the HRPT requested the changes because potential construction partners "expressed reluctance" to bid on the project, citing concerns about the pots' complex fabrication and installation challenges. The HRPT explained that an inadequate pool of bidders could lead to runaway construction costs. New drawings reduce the number of piles by 27 and the number of pots from 202 to 132. The remaining pots will be concentrated on the pier perimeter, concealing an interior supported by more traditional piles in steel and concrete. To visualize the changes, the original, more sculpted topography is depicted above, while the modified version of the design is below: Initially, the pots were supposed to provide the structure for the topography throughout; now the architects will use light foam material to create the rolling hills depicted in the renderings. In light of these substantial design modifications, one public space advocacy group is doubling down on its vocal opposition to the project. "Pier 55 was conceived and sold on the basis of a major sculptural art, so by putting it on a flat base and putting a lace tablecloth around it, the whole thing becomes a parody of itself," said Michael Gruen, president of the City Club of New York. The proposed changes, Gruen added, would reduce the amount of sunlight reaching the river for at least one hour per day by 36 percent, which could have an impact on marine life. The City Club has opposed Pier 55 almost since its inception. In a suit filed last year against the State Department of Environmental Conservation, the civic group's legal team contended that the Trust didn't do a proper environmental review of the project. In an email to supporters, the Club confirmed that that suit was dismissed, but called the court's decision "distressingly inaccurate." A second suit against the Army Corps of Engineers, the main permitting agency for the project, is ongoing. (Diller has called the lawsuits “garbage balls thrown at us.”) The group also contends that Pier 55, which sits between two city blocks, would obscure cherished public views of the Hudson. Plans show that the pier ranges in height from 9.5 to 61 feet above the waterline, potentially blocking the now-sweeping views. When reached for comment on the viewshed, pot count, and a request to verify other basic information in the document, the Trust, citing the pending litigation, declined to provide additional information "beyond what [it] has provided to the Army Corps." (Since press time, the Trust has issued the following statement: "The Trust has made technical alterations to make the project easier to build, but the topography, landscaping, program and size have not changed. Construction continues and we're looking forward to opening this addition to Hudson River Park in 2019." ) This article appears on HoverPin, a new app that lets you build personalized maps of geo-related online content based on your interests: architecture, food, culture, fitness, and more. Never miss The Architect’s Newspaper’s coverage of your city and discover new, exciting projects wherever you go! See our HoverPin layer here and download the app from the Apple Store.